Mark R. Brand: Five reasons I liked the Knights of the Old Republic video games better than the Star Wars prequel trilogy. Five reasons I liked the Knights of the Old Republic video games better than the Star Wars prequel trilogy. This is perhaps the most understandable fault of the prequel trilogy simply because of the necessity of sufficiently developing Anakin Skywalker and Obi-Wan Kenobi as characters. I thought the prequel films did a fairly good job of characterizing Yoda by giving him some of the cockiness that he would have had back in the day before the purge and exile to Degobah. I didn't mind Qui-Gon or Mace Windu and I thought that their interaction, while stilted, was relatively legit. What I did mind was their seeming lack of foresight. The Obi-Wan and Yoda we knew from the original films seemed able to use their own sense of patience and reason to accurately predict what would happen if Luke did one thing or another. In other words, they seemed quite skilled at predicting the outcomes of various choices and discerning the relationships between various causes and effects. The Jedi in the prequel trilogy seem unable to do this. They do not consistently make rational or unbiased decisions, though there is some effort to do so at various points, and certainly an overarching expectation of Anakin to do so based on the guilt he feels at giving in to his fear and anger. The prequel Jedi seem bigoted, almost. Haughty, proud, unafraid of consequences, and oblivious to anyone's distaste of them. This does set up the plotline of the prequels relatively well, but the reason I think this was done even better in Knights of the Old Republic is that (20,000 years before the events of the movies), the Jedi seem even more marginal than they do in the prequels. They aren't the benevolent irrisistible ambassadors of peace that they are in Phantom Menace, nor are they the galaxy's police force. They're more like an upstart religion with temples here and there trying to get a foothold. Not only do they not command the same sort of respect as in the prequels due to their lofty standing, they are almost shunned by mainstream Republic society as strange, unpredictable mystics who occasionally meddle in political affairs. In the KOTOR games, it is relatively common for Jedi to fall to the Dark Side and become Sith, and just as common for Sith to be redeemed. The dangers of the Dark Side are well known and potential Jedi are prepared for the eventuality of being tempted toward an easy path of power and success. The Jedi in KOTOR, in other words, seem to have their eyes wide open the way Yoda and Obi-Wan do in the original trilogy because they realize that peace is fragile and not guaranteed. When your character in KOTOR becomes a Jedi, it doesn't have that same "Harry Potter/Kid that Lived" feel that Anakin had in The Phantom Menace. Instead of joining the well-established Jedi school led by Dumbledoor.. er.. I mean Yoda, you join some outpost Jedi temple with a few local Jedi Masters who initiate you and send you forth hoping against hope (and experience) that the Dark Side doesn't get you. In the Revenge of the Sith, there's a hideously contrite moment where Palpatine sort of puts the old arm around Anakin and tells him he should "embrace a larger view of the Force" as though just a five minute conversation would be enough to turn him away from the Jedi he has been a part of for 15 years-ish. He has prescient dreams of Padme dying and instead of taking these visions to someone who might understand and letting them help him (as you would think most Jedi would have to do), he internalizes it and turns to Palpatine for help. This is completely unrealistic. In fifteen years of being a Jedi, the most special and anticipated Jedi of all time, NO ONE thought to mention to him that he MIGHT someday have prescient dreams that may or may not come true? When they sat him down for the "Jedi aren't allowed to have wives" conversation, they failed to mention this eventuality? In Knights of the Old Republic II, the main Sith Lord that you encounter goes through a subtle, yet startlingly convincing, series of demonstrations whereby the Jedi main character is shown the consequences of blindly doing good. People you help become victims again the moment your back is turned because they lacked the strength to defend themselves to begin with and you did nothing to strengthen them. Leading others on the straight and narrow path of righteousness provides a never-ending parade of bad feelings, and petty human conflict among those you're trying to lead. If your character chooses the Dark Side, other characters begin to follow you and easily fall in line, creating a false sense of security. You can bring order, but at what cost? Taking the high road involves constant and annoying divergence, sacrifice, and tedium. This, to me, seems like a MUCH more realistic and valid approach to why an otherwise-stellar young Jedi would turn to the Dark Side. Aside from the help that this subtlety gave to the plot, it was an interesting philosophical dialectic in and of itself. It's sort of sad that the people who wrote this video game did a better job of convincing me that the Dark Side is seductive than George Lucas himself. Also worth mentioning is the worthy and understandable but somewhat off-key inclusion of Christopher Lee as Count Dooku. Was he great? Of course, Christopher Lee is just magnificent in almost anything. Was he scary and intimidating as a Sith? Not really. I felt like Attack of the Clones and Revenge of the Sith lost something here and there based on the lack of a truly terrifying and intimidating Sith character. Sidious (Palpatine) pretty much sat most of the films out in the Chancellor's Chambers and only really came alive in the last hour or so of Revenge of the Sith. The films lost some of the momentum that the lightning fast stunt actor and martial artist Ray Park bought them with the very intimidating Darth Maul. 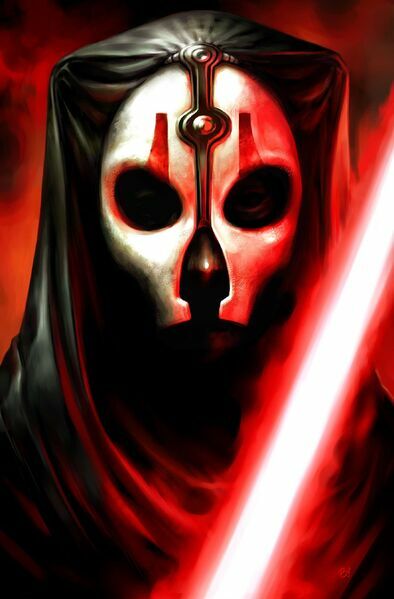 Compare this to Darth Nihilus (pictured below) from KOTOR II, who speaks in a series of harsh, unintelligble, ghostly whispers, and can bring Jedi to their knees without even lifting a finger. Something like that hunting you and bringing your character to an inexorable confrontation adds a depth of suspense that the prequel trilogy lacked. I mean, I realize that Darth Vader is a hard act to follow. He's probably the most well-known and easily recognizeable villain on the planet, but at least Darth Maul and Darth Nihilus gave it a good shot. Part of the greatness of the original trilogy was the utter impressiveness of the spaceships and technology involved. We all wanted to fly X-Wings and blow up TIE fighters and we were all slightly intimidated by the sheer massiveness of Star Destroyers like huge battleships in space or the gigantic Jawa trawler or AT-AT. The prequel trilogy contained almost no distinct spacecraft. The only things that come to mind as memorable from the prequels were the droid army vehicles, the pod racers, and Count Dooku's solar sail. These were pretty interesting, but other than that I have almost no recollection of unique, interesting, or compelling spacecraft in the entire three-movie prequel run. Knights of the Old Republic has only a few new things to offer, but what there is is impressive. The Ebon Hawk is the spaceship that the main character gets to take from planet to planet. Obviously influenced somewhat by the design of the Milennium Falcon, the Ebon Hawk is distinct because of its relative sturdiness. Whereas the Millenium Falcon seemed like it might fall apart at any second, the Hawk seems smaller, faster, newer, and built to last. Also, you get a lot of chances to explore the interior of the ship, most of which we got in only small glimpses in any of the Star Wars films. There are a number of forgettable spaceships in Knights of the Old Republic as well, but one that's hard to forget is the decaying, half-destroyed Ravager from KOTOR II. It's something like a Star Destroyer that's sparking and falling apart right under the characters' feet. As the main character, you storm this ship with your party and avoid things like flash-fires and doors that vent out into space to finally reach Darth Nihilus. It doesn't have the iconic nature of the Death Star or the original Star Destroyers, but it does have some of that gravitas, which nearly all the sets and ships in the prequels lacked. In the prequel trilogy, we got a hint of this in a few scenes, but they were almost always brief cameos of our favorite characters from the original movies. We got to see a little Rodian (Greedo) in the background of the podracer scene in Phantom Menace, there was a Twi'lek Jedi (Jabba's dancer and Bib Fortuna from Return of the Jedi) named Aayla Secura that had a brief death scene in Revenge of the Sith, and in some of the senate scenes on Coruscant throughout the prequels we got to see all sorts of random races represented including, thrillingly, E.T. George Lucas made a little bit more out of parts for characters he knew the fans wanted like Wookies and Hutts, but even then the scenes were limited and didn't move the story forward in any significant way. Imagine a Jedi in this armor with a lightsaber in each hand and you'll get some idea of why KOTOR and KOTOR II were as great as they were. All right, all right, Coruscant was pretty neat in a couple of scenes in the prequel trilogy. The scene where the Clones are all departing and the giant capital ships (precursors to Star Destroyers) are launching at the end of Attack of the Clones was impressive, and we got more of Tatooine and our first brief glimpse of Kashyykk the Wookie planet. Aside from that, though, what did we get? Naboo and the Gungans? I think we can all agree that was lame, though the capital city was gloriously rendered. Kamino and the cloners? Double lame, despite the terrific idea of an all-water planet. Whereas the original trilogy used the setting as part of the story, the prequels stomped all over the coolest settings by forcing us to swallow the contrived plot developments during our experience of them. I felt like I couldn't enjoy Kamino because I had to listen to the stilted and strange dialogue between Obi-Wan and the disappointing nobody that played Jango Fett. And we got Geonosis, which was the separatist planet that the huge battle at the end of Attack of the Clones was fought on. Maybe it's just me, but the whole time I was thinking: this place looks exactly like Tatooine. And it did. It's very uncharacteristic of the franchise of Star Wars to do this, and I found it to be a big cop-out in terms of the overall quality of the other films. It's not as if Lucas couldn't have just digitally cropped his actors into some other planetary setting. I understand the rigors and expense of shooting on location, but this isn't an average film, this is Star Wars, and one planet looking like Tunisia (which is where they shot the scenes for Tatooine as well) was plenty for me. The single high point of the prequel trilogy planets came for me when we finally got to see Musafar, the lava planet at the end of Revenge of the Sith. Sadly, its subtle echoes of the cloud city duel on Bespin and terrific dueling sequence can't carry the entire three-movie cycle for me. Knights of the Old Republic takes place stretched over the surface of something like seven or eight planets, including some familiar names like Tatooine, Dantooine, and Kashyykk. A couple of planets look similar to prequel planets, which is understandable. Taris is a less-slick city planet like Coruscant, and Dantooine resembles Naboo somewhat. On the other hand, we get several completely new places as well. Nar Shadaa is the "Smuggler's Moon" which is basically like a pirate port in space with all of the familiar scum and villainy from Mos Eisley in the original Star Wars movie. Malachor V is a planet that has been bombarded into apocalypse from space and contains only the wreckage of spaceships and mutated monsters that can live in utter desolation. Korriban is the distant rocky planet that the Sith originated from and contains the Sith temples and graves of several prominent Sith Lords. Manaan is another "completely covered in water" world. Dxun is the jungle moon of the Mandalorians, and and Onderon is a planet full of beasts with a walled capital city called Iziz that looks like a medieval crusader city. Of course as in any video game, you have to visit place X to retrieve item Y and perform task Z, but given the lackluster planet settings of the prequel trilogy, the makers of Knights of the Old Republic set just the right tone to invoke some of the majesty of the original films. So to make a long story short, if you loved the original Star Wars films and were at all let down by the prequels, you should check out the Knights of the Old Republic video games. They more than any other Star Wars material since the first films have captured the "right" feel of the original Star Wars.